I was trembling with anticipation as I made my way down to Ion Food Hall on a Monday morning to pay homage to the much raved about Arinco King. Good news. No queue! Arinco Fever must have finally died down. After randomly scanning through the list of items available (sandcakes and rollcakes), I decided to order the salt caramel rollcake, which is touted to be the best selling item in the shop. The rollcakes. Choose from vanilla, salt caramel and matcha. Each flavor comes with its own unique box, complete with ice packs that can last for up to 3 hours. At SGD18 per roll, the salt caramel rollcake is no cheap treat. The store doesn't sell individual slices (so its one whole roll or nothing). Each roll ain't that long either- it can comfortably feed 5 people at most. Consumed by greed, I decided to dispense with niceties and ask for a slice of the roll to be cut for me a la minute . The service staff obliged and proceeded to do so with utmost precision and finesse. I was suitably impressed. The roll was every bit as scrumptious as it looked, with a sinfully rich cream centre spiked with hints of bittersweet caramel, encased in a velvety sponge exterior. This was unlike any other roll I had ever eaten. Everything about it was fresh, exquisite and delicious. Due to the open concept of the Food Hall, seating is highly limited. It was a mean feat trying to gingerly cradle my handbag in one hand whilst eating my precious roll with the other. Nonetheless, with the JPY skyrocketing at such high levels against the SGD these days, this is a small price to pay for a piece of Japanese heaven right here in Singapore. Now that's one less reason to trudge all the way to Changi Airport for your Popeyes fix. This "strategy" has paid off quite handsomely so far. Some of the items I have won to date include ipods, movie tickets, toiletries and food vouchers. Although some might think it is a little frivolous to go gaga over such insignificant freebies, its amazing how these little surprises can add color to an otherwise dull (and luckless) day. Over time, I'll be intermittently posting up details on contests which I think are too good to miss. This contest is pretty straightforward. Every Mon, a Japanese-food-related question will be posted in the below link. All you have to do is to be one of the first 2 folks to email the correct answer (together with your name, ic and contact no) to nfarisha@panpacific.com with the subject header "Think You're a Foodie?" and you'll soon find yourself feasting on a delectable "Keyaki Palate Pleaser" (includes two pieces each of Blue Fin Tuna, Yellowtail and Scallop sashimi and a bottle of Keyaki Sake (180ml)). The catch? You have to be the first 2 to email the correct answer. Which means that if you really want to win, you should standby your computer at 12am on Sunday night and keep refreshing the above link to ensure that you are the first to receive (and respond to) the updated question of the week. May the "win" be with you! This is a distinctly Singaporean Japanese restaurant. The chefs are local, the servers do not speak Japanese and even the food seems catered to local tastebuds. Having said that, there's a definite charm to the place that keeps me returning for more. The unassuming interior resonates with warmth, its simple yet cosy ambience making it an ideal spot for a quiet weekday meal. Service is sincere (though occasionally lacking during peak hours) and the food is generally good. 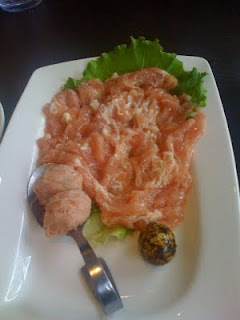 Whilst the menu boasts a decent selection of assorted raw fish, these do not feature as prominently as the cooked items. In our latest visit to the restaurant, my partner and I decided to order our usual favorites as well as a couple of new dishes. Fried Salmon Skin- The greyish salmon skin looked hideous in its unmasked glory but passed the taste test with flying colors. The bite sized pieces were light and crisp, with a texture and taste similar to that of seasoned seaweed. Megumi Maki- This is one of my personal favorites. The clean fresh flavors of avocado, cucumber and crabstick drizzled with a generous mountain of ebiko roe never fail to strike the right chord in me. Miso baked eggplant- Another personal favorite of mine. The nutty miso paste slathered liberally on the soft underbelly of the grilled eggplant is highly addictive. This is one mushy dish that is very, very good. Garlic Fried Rice- A serving of this dish can feed 2. Each grain of rice is bursting with wok hei goodness- definitely one of the better versions of garlic fried rice I have tried so far. Unagi tofu- I am typically not a fan of unagi so this dish does not particularly appeal to me. The tasty batter encasing the unagi crusted tofu however makes all the difference. If only I could just order the batter and tofu alone. Drinks- We usually order ice green tea. However, being a sucker for packaging, I decided to order a bottle of Maru (currently on promotion at SGD28 per bottle). Maru is a gimicky dry white wine which is supposed to go well with "sushi and asian food". It added unparalled sweetness to the raw fish and heightened our dining experience to almost dizzying levels (alcohol level is 12%). We couldn't finish the whole bottle and barely made it home that night. If you are driving, do note that parking space directly outside the restaurant is highly limited. Your best bet is to park at the public carpark across the road (beside the Shell Station) and take a short stroll over. Reservations are strongly recommended. The best days to visit are Tuesdays to Thursdays. There are 2 sides to good ol Katong. One side comprises of seedy KTV pubs with unsavory influences. The other is practically bursting with all kinds of delicious eats (Katong Laksa, Boon Tong Kee Chicken Rice, Puteri Mas Durian Puffs and Tau Kwa Pau just to name a few). Kim Choo is one of the few institutions left in Katong which has withstood the test of time. Housed in a refurbished shophouse, the restuarant is split into 2 quarters- an air conditioned one for dine- in customers and a non air conditioned one selling a mind boggling array of knick knacks including but not limited to nonya kueh, nonya dumplings, otah, cakes, pastries, biscuits and sauce mixes. The owners take great pains to ensure that the restarant's interior stays true to its Peranakan roots. Pretty Perakanan tiles and Peranakan crockery/baskets line the counter and walls. The 2nd floor even houses a Peranakan museum. As we were only feeling peckish that evening, we ordered 4 dishes to share. Portions are generous and reasonably priced. Better still, the restaurant does not impose GST and service charge. Achar (SGD2)- The obligatory appetiser. A little too watery for my liking. Beverages- Good variety. Choose from local favorites like lime juice, sour plum drink and water chestnut drink (SGD2 each)..or drown your weekday sorrows away with a bottle of beer. Ps: Adam's Ale is charged at 30 cents a cup. "Grocery" shopping at the second quarter after dinner is an absolute must- I ended up lugging back SGD77 worth of home-made sugee cookies, cashew nut cookies, kueh bankit, love letters and open faced pineapple tarts. (I tried the pineapple tarts this morning and give two thumbs up!). 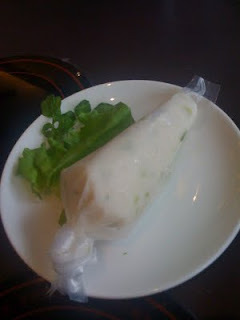 Nonya nazis would also give their stamp of approval to the restaurant's highly acclaimed nonya zhang (rice dumplings), otah and kuehs. A trip to Ember is like reconnecting with an old friend and concluding (with much relief) that nothing has changed. The ever affable Sabrina fronts the restaurant with confidence and ease. Over in the kitchen, her husband Sebastian works his magic, churning out dish after dish of gastronomic masterpieces. The restaurant usually runs at full capacity, especially during lunchtime where most opt for the highly popular SGD38+++ set lunch, comprising of a starter, main course and dessert (inclusive of coffee and tea). The crowd is predominantly local, with many hailing from the nearby Central Business District. Most are here for pleasure rather than business as the low lying ceiling tends to amplify noise, making conversation a little challenging at times. Selections in the set lunch menu are extensive and would please even the fussiest of diners. An addictive home made warm walnut loaf is served to all guests on the onset, providing a lovely teaser to what lies ahead. Service is unpretentious and obliging- don't be afraid to ask for more bread! For set lunch that day, I opted for bamboo clams (Starters), miso cod (Main) and Chocolate Fondant with Vanilla Bean Ice Cream (Dessert). Every dish was executed beautifully and left me hankering for more. Bamboo clams- A refreshing take on this dainty shellfish which is commonly served with garlic/soy sauce/black bean sauce in Chinese seafood restaurants. The slivers of crunchy white flesh came perfectly steamed and were paired with a shimmering mustard-like sauce. I was blown away by the unique blend of textures and flavours. Miso cod- A perennial favorite of mine. The sweet miso sauce is well absorbed into the cod, resulting in luscious petals of caramelized flesh that effortlessly glide down the throat. Heaven. Meatlovers to note: The restaurant does not serve its beef well done as this tends to give rise to dry and unflavorful meat. I'm not a beef lover so I will allude to the chef's (better) judgment on this one. Chocolate Fondant with Vanilla Bean Ice Cream- This dessert has been surfacing in numerous restaurant menus at an alarming rate. However, few restaurants can execute this dish as well as Ember. Everything about it is rich, sinful and downright delicious- from the molten lava to the pretty vanilla bean speckled ice cream. Tea/Coffee- Love the way the restaurant thoughtfully throws in good tea/coffee as a finishing touch. My camomile tea (no teabags..they use the real thing) came with honey and was the perfect remedy for my restless weekday spirit. Better still, I got a whole teapot and a little cookie to myself. Ps: I have a love-hate relationship with the restroom. Its retro design fits perfectly with the eclectic vibe of Hotel 1929, where the restaurant is housed. However, its also unisex AND super squeezy. I still get a little queasy when I use it. Guess this is a small price to pay for dining at one of my favorite chi chi lunch spots in Singapore. Although I'm no liquor expert, one thing's for sure- I love moscato. Its sweet, light and fizzy all at once. Best of it, it doesn't carry the heavy price tag of champagne. On days when life has been far from kind, a well chilled glass of moscato over dinner (followed by a good night's sleep) never fails to perk me up. Recently, I had the good fortune of dining in a restaurant (Ristorante De Parma) which serves a delicious pink Australian moscato from The Innocent Bystander. A 375ml crown sealed bottle costs SGD18+++, which is decent value. This is by far one of the better versions of moscato I have sampled so far, boasting just the right amount of sweetness, fizz and fruitiness (summer fruits, rose petals and turkish delight). Unfortunately, I have yet to locate an accessible wineshop which stocks this label. In the meantime, I guess I'll just have to settle for the Brown Brothers version. Another pink moscato which I am looking forward to trying is Princess Moscato by Peter Lehmann Wines. Selected Denise Wine Shops carry this label and I hope to pick up a bottle in the coming week. Maths has never been my strongest subject. My answer sheet was always fraught with careless mistakes and question marks. Thankfully, with the help of tuition and sheer luck, I made it through school relatively unscathed. This year, my heart goes out to the poor Primary 6 kiddos who were presented with a difficult Maths Paper during the PSLE. Apparently, many did not manage to finish the paper whilst others came out brawling. In response to feedback from concerned parent,s the Education Ministry had this to say".....this year’s paper was "comparable" to those of previous years. There is no change in syllabus, question types or number of questions..."
Below is one of the questions which came out in the exam. Even reading it is giving me a massive headache! Gosh. I feel so stupid! "Jim bought some chocolates and gave half of it to Ken. Ken bought some sweets and gave half of it to Jim. Jim ate 12 sweets and Ken ate 18 chocolates. The ratio of Jim’s sweets to chocolates became 1:7 and the ratio of Ken’s sweets to chocolates became 1:4. How many sweets did Ken buy?" Ps: In case you are wondering, the answer is 68. I love my food but seem to lack the knack for cooking and baking. Thankfully, that has not quelled my interest in trying out recipes and attending cooking classes. Pity my other half who is always on the receiving end of burnt/undercooked products, bland food (in line with my well meaning attempts to cut down on salt, sugar and butter intake) and sullen tantrums (when my attempts to encourage a second helping are flatly rejected). 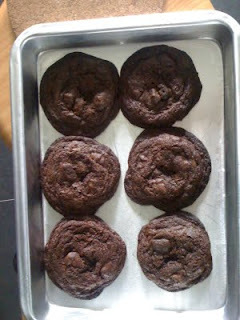 Today I was bitten by the baking bug and decided to whip up a batch of Nigella Lawson's Totally Choocolate Chip Cookies. I adore Nigella Lawson because she somehow manages to pull off being plus sized and gorgeous at the same time. Plus her recipes are easy to follow and usually fool proof. Check out her cool chocolate chip cookie demo on You Tube. She makes it look so effortless. I proudly assembled my ingredients on the kitchen top and secretly conjured up grand illusions of a perfect chocolate chip cookie which would be sought after by generations to come. Afterall, this was quality chocolate I was using (Varlhona jivara chocolate) and my Madagascan vanilla essence cost over 30 bucks for a tiny bottle. Everything seemed under control right up till the very moment I slid the tray of cookies into the oven. Mistake 1: I had forgotten to preheat the oven. Mistake 2: When I actually remembered to do so, I had misread 325 degrees farenheit for 325 degrees celsius instead (i.e. waaaay too hot!). When I realised my folly the first batch of 6 cookies was already burnt. Tray no 2 experienced a better fate. I adjusted the temperature to 250 degree celsius and only baked the cookies for 12 mins (although the recipe calls for 18mins) as my Baby Belling tends to overheat. The cookies still came out slightly burnt at the edges but tasted quite good. Unfortunately, they had flattened out in the oven and were stuck to each other. 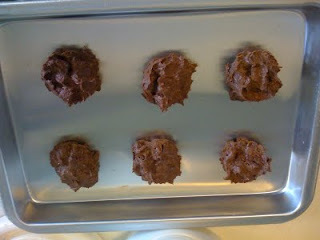 Being my usual impatient self, I shoved a knife under the base of the cookies, hoping to dislodge them from the tray. As the cookies were still cooling, some of them broke into pieces. 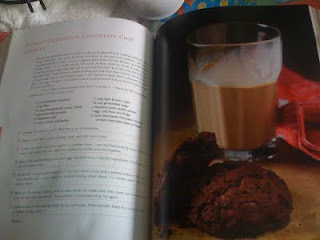 Upon closer inspection of the cookies, I also realised that they looked rather flat compared to those pictured in the recipe book. Was that due to my substitution of baking soda with bicarbonate of soda? I feel a little tired after all the baking. However, I am confident that one day I will come up with a worthy chocolate chip cookie recipe. Being die hard steamboat fans always on the prowl for good deals, my kaki and I decided to give JPot's set lunch a shot. Set lunches (starting from 9.80+++) are a wallet friendly alternative to dinner as ala carte prices tend to be toppish. The restaurant is tucked in a quiet corner of Vivocity. We literally skidded to our seats as the wooden floor was quite slippery. Other than that, the restaurant's interior is aesthethically pleasing with good ventilation and a picturesque view of Sentosa. My kaki ordered Set A (9.80+++ comprising of marinated pork slices, 2 pork balls, a small basket of vegetables and mushroom and a bowl of rice). She chose a bak kut teh soup stock. I opted for Set B (12.80+++ comprising of beef slices, 2 beef balls, a small basket of vegetables and mushrooms and a bowl of rice). My soup base comprised of a superior broth concocted by the restaurant. Enticed by mouthwatering descriptions of the "popping" fish skin (3.80 a portion) and "DIY" fish noodles (3.50 a tube), we ordered a serving each to share. 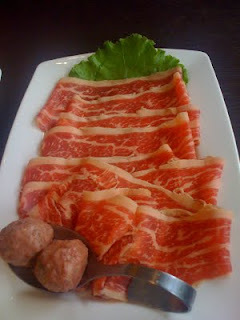 I preferred the beef set to the pork set as the thinly sliced beef was a breeze to cook and boasted sufficient bite and flavor (as opposed to the marinated pork slices which was over-tenderized to the extent that it didn't really taste like real meat anymore). The soup stocks initially came across as peppery and bland but gradually took on a lovely umami flavor after fully absorbing the meat and vegetable juices.